An adventure from Metro's ¡Vámonos! project. Using the ¡Vámonos! 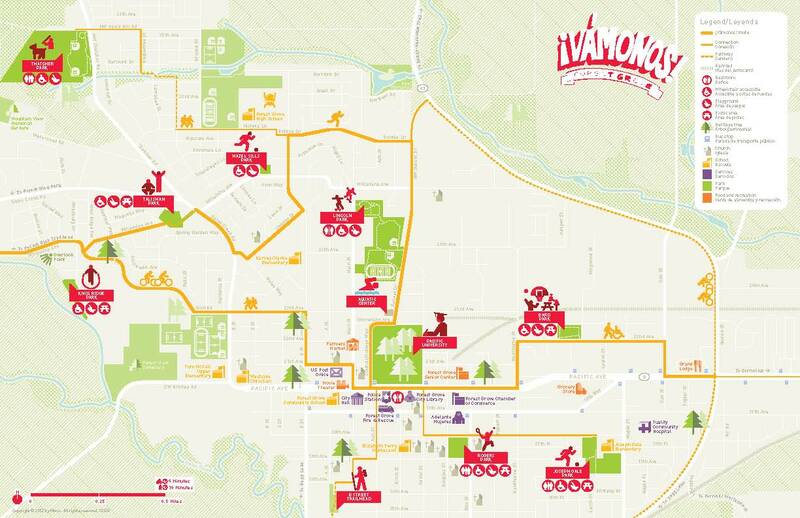 Forest Grove map, this adventure is a 5.7-mile biking and walking route plus connecting routes that take you through two neighborhoods on the National Register of Historic Places. You’ll pass by schools, parks, farms, a farmers market and downtown’s shops and dining. Along the way are views of Cascade and Coast Range peaks, valley bottomland, beautiful homes and heritage trees. Start your Forest Grove biking tour downtown at Main Street and 21st avenue, one block west of Pacific University. On Main Street you’ll see restored brick buildings dating from the 1890s and offer local shopping and dining. During warmer months, this section of Main Street (between Pacific and 21st avenues) closes to auto traffic to host the weekly Forest Grove Farmers Market. The market is managed by Adelante Mujeres, the Forest Grove nonprofit that provides Latina women and their families with the tools they need to flourish. Find organic produce, cheeses, local art and music Wednesdays, 4 to 8 p.m., early May to mid-October. Proceed west (right) on Pacific Avenue from downtown and pass through quiet, old streets of the Walker Naylor Historic District,. One of three historic districts in Forest Grove, it sits to the north of downtown and west of Pacific University and represents a century’s worth of Forest Grove history. Home styles range from the large, ornate homes of university faculty and city businessmen in the mid-1800s to smaller World War II-era cottages. The area was initially settled by the town’s professionals and businessmen who constructed Victorian homes on large semi-rural lots. 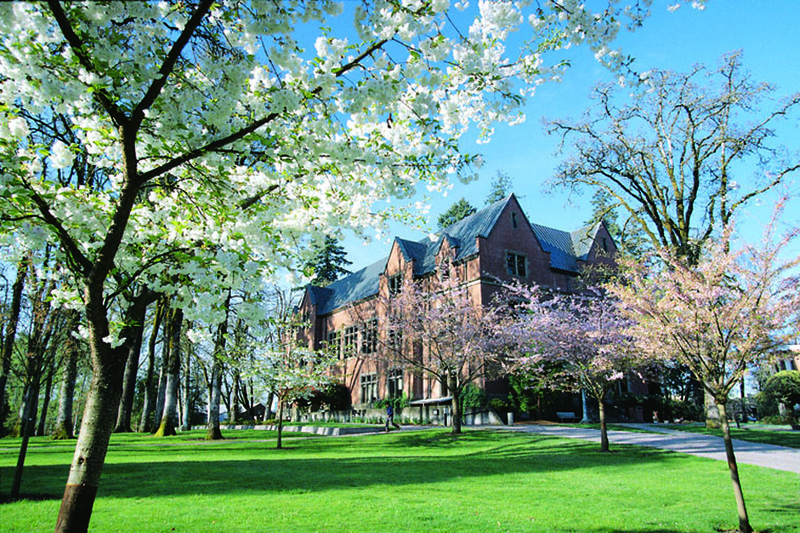 By the early-twentieth century a regional boom fueled by demand for agricultural and forest products resulted in a burgeoning downtown, increasing enrollments at Pacific University and the accompanying expansion of residential neighborhoods. Turning right, ride along B Street for three blocks, and then turn left on 23rd Avenue. Follow 23rd Avenue .9 miles as it curves north onto Goff Road and onto big views at overlooks of the verdant Gales Creek floodplain and Coast Range beyond. As Goff Road splits, turn right onto Willamina Avenue, and follow for .9 miles to quiet Talisman Park, home to an enormous spreading Oregon white oak that set down roots long before settlers built the first log cabin in today’s Forest Grove. Following the park trail to Northwest Willamina Avenue. For a longer tour, turn left on Gales Creek Road and continue onto Thatcher Park. In this, the city’s newest park, and find views of Cascade peaks, hiking trails, ball fields, and an off-leash dog area and picnic grounds. For a shorter trip, cross Gales Creek Road and continue along NW Willamina Avenue, pass the small pocket park Hazel Sills Park, and turn right onto Main Street. 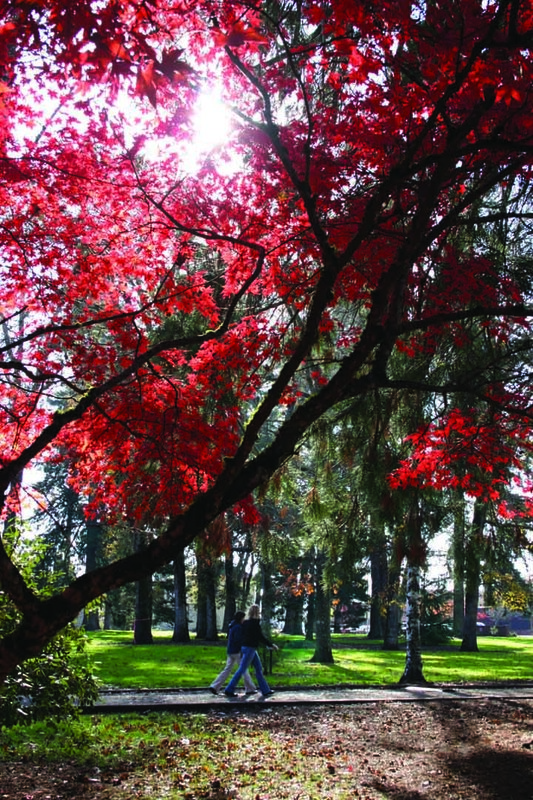 Just past 28th Avenue, take a break with one of the many recreation options at Lincoln Park. If you can roll on it, throw it, bounce it, kick it or splash with it, take it to Lincoln Park. This large, public recreational complex has it all: every kind of ball field, a playground, BMX course, skatepark, walking trails, and the Forest Grove Aquatic Center with its indoor pools and outdoor spray park. • Marsh Hall, the large red brick building beyond the stump, in the center of the campus. Built in 1895, it burned in 1975 and the interior was rebuilt within the shell. • Old College Hall, the white wooden building along College Way. Constructed in 1850, it is the oldest building in continuous educational use west of the Rocky Mountains. • A labyrinth to walk, next to Old College Hall, at College Way and Pacific Avenue. Walking a labyrinth reduces stress, provides reflection or replenishes energy. Labyrinths differ from mazes: in a labyrinth, the path is clearly seen to the walker, and there is only one path to the center, with no false dead-ends. • As College Way ends, turn right on Pacific Avenue, home to City Hall, the police station, public library and the Forest Grove Chamber of Commerce to the east. Take Pacific Avenue a short half block, turning right onto Main Street. This route takes you by beautiful homes of the tree-lined Clark Historic District to the B Street Trailhead after turning right onto 16th Avenue. The 1-mile B Street Trail passes through the Gales Creek floodplain, with far-ranging views of rolling valley bottomland. It’s part of the in-progress Emerald Necklace. Five miles are complete of the eventual 13-mile-long pathway around the city. To head back to downtown Forest Grove, loop back on the B Street Trailhead, which ends at the well-traveled and narrow B Street and not recommended for cyclists. For another, shorter, connecting route from Pacific Avenue, turn left and continue five blocks turning right on Elm Street, leading to historic Roger Park at Elm Street and 18th Avenue. In 1890 a mansion sat in the block that is now the park. An oak grove in the park is home to acorn woodpeckers; look for their red heads and black backs. After the mansion was torn down, the park became a trailer park, housing agricultural workers during WWII. Past the park, turn right onto 17th Avenue, continuing five blocks east to Main Street. Turning right onto Main will take you back downtown and our starting point. Metro has partnered with Kaiser Permanente to create bilingual ¡Vámonos! maps to encourage walking and biking in Hillsboro, Forest Grove and Cornelius. Learn more about all three ¡Vámonos! maps at: www.oregonmetro.gov/vamonos. Encourage your friends to enjoy The Intertwine along with you.